Get ready to celebrate Independence day with more excitement and happiness. You will get live performances, gifts, celebrations and discounted sale, all under one roof with Dolmen Mall Independence Day. However, the celebrations will last from 10th to 14th August 2018 in all three Dolmen Malls in Karachi; Clifton, Tariq Road, and Hyedri. So, this Independence day takes part in Campaigns to grow in Pakistan, do shopping and enjoy patriot anthems live by famous celebrities. Through the following campaigns, you can not only make fun but can also participate in the development of Pakistan. Rang Do Pakistan: participate in this campaign to plant more than 1.4 Million trees to make Pakistan green and mark yourself green. Adopt Education: to adopt a child for education from citizens’ foundation and donate your money to educate the children. 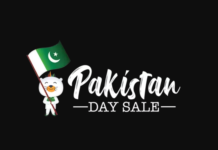 They have announced various amazing activates under Dolmen Mall Independence Day Celebrations apart from games and campaigns. The customers will share their photos and they will display them live in the mall. Moreover, the customer can share the photo through social media or by visiting the mall. All the national and international dresses collection in the name of Azadi collection will be provided to the customer on special discounted rates. In this activity, you have to share the old memories of your parents and grandparents. Moreover, you have to share the photos, videos, and memories of old building and people stories etc. They will launch this live in the mall. This program will be launched with the collaboration of Dolmen mall and I am Karachi. They will invite you to sing the 50’, 60’, 70’, 80’, 90’ and present-day anthems at the mall. Moreover, you will sing the anthems with famous celebrities. You will be given the chance to play all-time favorite Ludo, Carom, Pittu Garam, and Hopscotch. You can take selfies with celebrities and friends. Hence, the mall will display your photos send shots in the live session. If you will spend more than 5,000 while doing the shopping in the mall, you can enter in the lucky draw of the Dolmen Mall. If you will participate, you can win one of the following prizes and gift hampers.